An ideal high temperature gasket where extra abrasion resistance and, or, the ability to withstand oil, moisture, molten splash or flame is required. 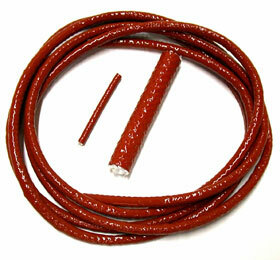 ADL Insulflex PyroRope™ is a braided or knitted E-glass rope with a thick coating of iron oxide red silicone rubber. Rated for 260°C continuous exposure and 1650°C intermittent, PyroRope™ makes an ideal gasket where you require thermal performance plus resistance to wear and exposures. 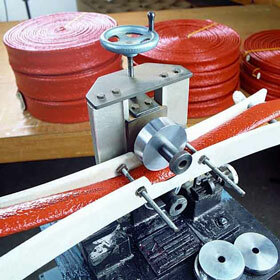 A variety of knitted or braided ropes can be used as the E-glass substrate to vary the compression density. Diameters from 6mm to 76mm. Odourless non-toxic curing agent sets up in under 10 minutes, and cures completely in 3 - 6 hours at typical room temperature. Designed to coat Pyrojacket® and Pyroblanket™ ends. 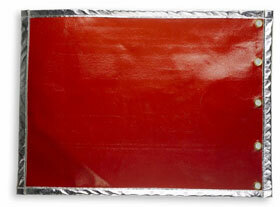 Newly developed Odourless End Dip™ is designed to coat Pyrojacket® and Pyroblanket™ at the ends. This special formulation of liquid silicone rubber prevents fraying and the absorption of flammable or other contaminants into exposed glass fibres. Unique liquid silicone rubber formulation utilises a non-toxic, odour free curing agent, eliminating the need for costly ventilation systems during the curing process. Available in 1 L, 4 L and 20 Kg pals. Hi amorphous silica content out performs other high temp sealants as a seal or gasket in severe environments. Pyrosealant™ forms durable, flexible, vibration-resistant gaskets directly on the flange, and cures to a tack-free state in 10-15 minutes under normal room temperature conditions. 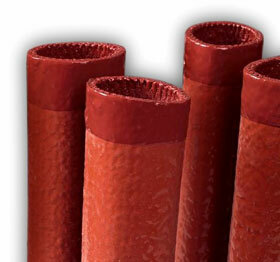 ADL Insulflex Pyrosealant™ is a heat resistant iron oxide red sealant and gasket making material that cures at room temperature into a tough, rubbery solid. It is composed of amorphous silica, polydimethyl-siloxane, iron oxide, and a specially developed curing catalyst to facilitate a moisture-sensitive cure at room temperature within approximately 18 hours. Standard cartridge or custom packaging. 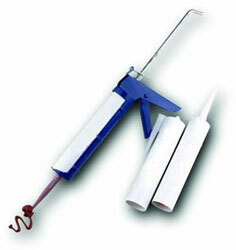 Supplied in 310 ml caulking cartridges. Custom packaging is also available. If wear and exposure are part of the problem, we can custom design removable insulation covers to handle the harshest conditions. Heat insulation alone may not be your solution. Requirements for thermal performance are often accompanied by the need to solve issues of abrasion, oil, moisture, vibration and flexibility. Our solutions combine the physical and thermal properties of Pyroblanket and fibreglass/silica/ceramic internal insulation to create custom removable insulation covers for the most hazardous and severe environments. Custom made covers for exhaust manifolds and turbos on heavy diesel engines. Custom made furnace covers to protect people and equipment from heat and molten metal splash. Welding spatter and grinding swarf protection covers, on mobile equipment, rail grinders and construction applications. If your problem doesn't have an off-the-shelf solution, "custom" is customary. All Insulflex® fire blanket and heat resistant cloth products can be fabricated into protective hanging curtains, with various accessories including glass fibre, ceramic or stainless steel thread, non-magnetic grommets, abrasion edge trim. 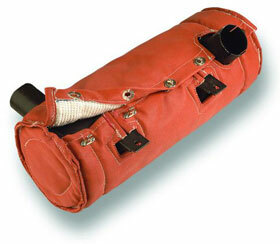 Different materials can be combined to achieve maximum splash and flame resistance. We custom design and fabricate protective curtains to meet virtually any need. Applications range from molten splash resistance around foundries and electric arc furnaces to large volume OEM parts on locomotive engines and heavy equipment. Our private branding capabilities allow us to put your company name and logo on some of our most popular products such as Pyrojacket. Please contact us for more information: Tel: 0114 244 1001.